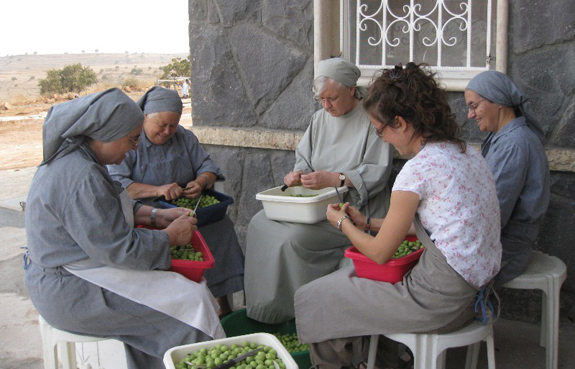 "It's still a small underground movement but it is nevertheless gaining momentum: female priests. One hundred and fifty women have now been ordained around the world. They're automatically excommunicated by the Catholic Church but that hasn't stopped a growing number of them from answering God's call. Our reporters speak to the first woman to be ordained as a priest in San Francisco." 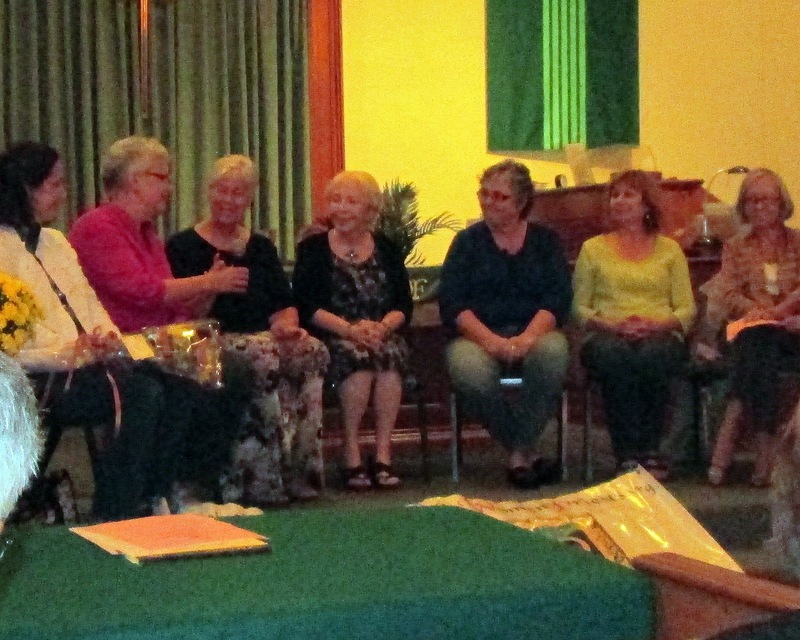 international women priests' movement in the Roman Catholic Church. 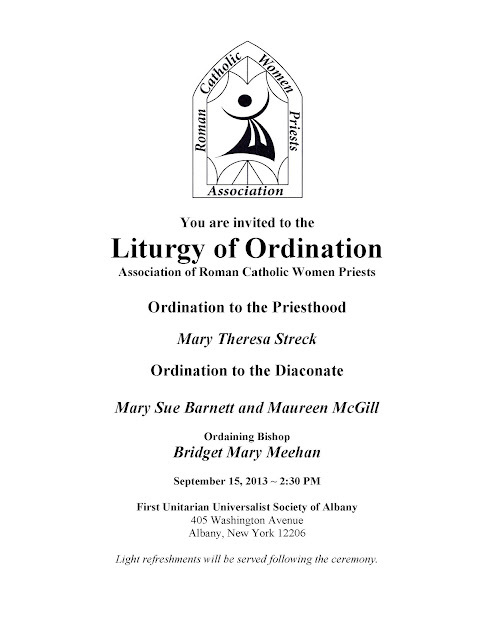 You are invited to the liturgy of Ordination of Mary Theresa Streck to the Priesthood and Mary Sue Barnett and Maureen McGill to the Diaconate. 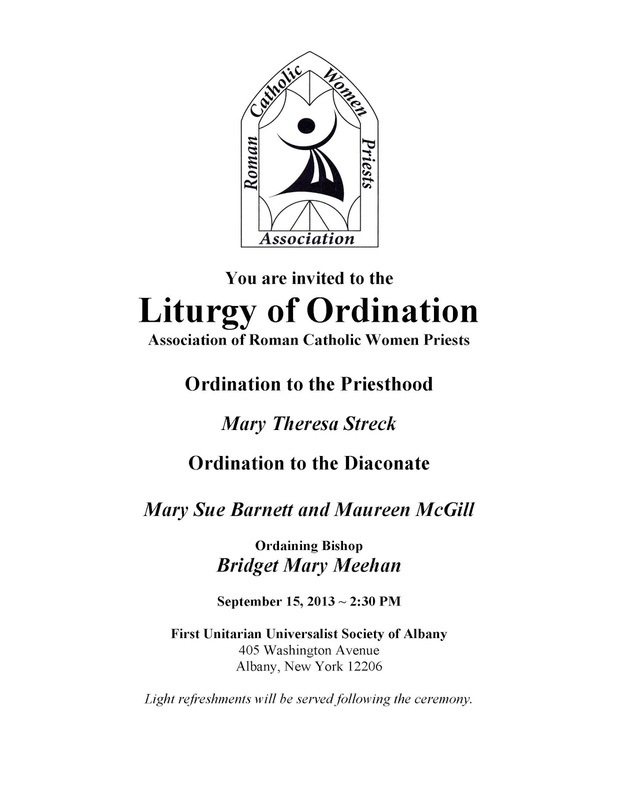 ALBANY -- Eleven of the country's 100 women who call themselves and work as Catholic priests will gather in Albany this weekend for the ordination of Mary Theresa Streck into the Association of Roman Catholic Women Priests. "To facilitate bringing people together to celebrate Eucharist and all celebrate Eucharist together. We are all saying the words of Consecration and all praying together in a community of equals," Streck explained of her calling. The ceremony will be performed by a bishop affiliated with the Association of Roman Catholic Women Priests. Bridget Mary Meehan was one of the country's first women priests and denounces the Vatican's position that this is not a valid ordination. "We are faithful Catholics who love our church and who embrace the vision of Jesus and the Gospel," said Bishop Meehan. 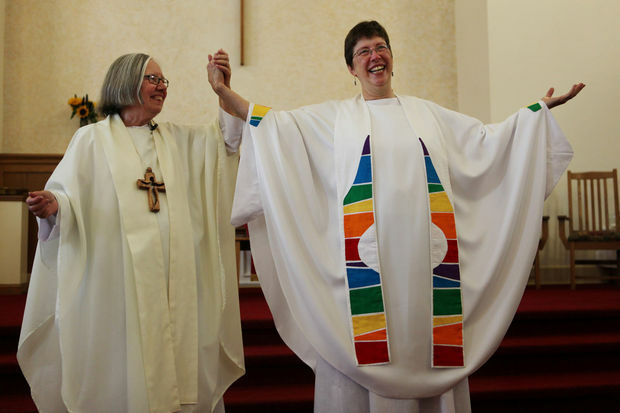 Once ordained, Streck will lead what she describes as an inclusive, Catholic community of about 40 people -- men, women, gay, straight, divorced, married and single -- at a Unitarian church in Albany. "(People) who have been pretty much disenfranchised from the church and so they look for spirituality, a place they feel welcome and a theology that resonates in their heart and soul," added Streck. Despite her new position, Streck plans to also attend a church within the Albany Diocese. According to Diocesan spokesman Ken Goldfarb, "...A woman who claims to be an ordained Roman Catholic priest has separated herself from full communion with the Roman Catholic Church Further, the sacraments she celebrates are not considered valid in the eyes of the Roman Catholic Church." "It's really about sexism," added Meehan. "There is a blockage with women not seeing them as true equals. The gift of our movement is we are equal images of God." Goldfarb stated, additionally, that sacraments like communion are a private matter between a pastor and an individual. Streck's ordination is at 2:30 p.m. Sunday at the Unitarian Church on Washington Avenue in Albany. Contact: Mary Theresa at mtstreck@gmail.com. Media welcome. 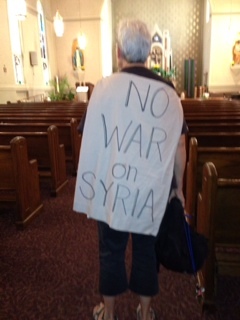 Are We Ready To Walk Through The Moral Fog Using Nonviolent Alternatives? We write to invite you, friends and neighbors in faith communities across our nation, to join us this week in holding Congress in our prayers as they contemplate their response to our president's proposed military strike against Syria. We recognize the seriousness of the issue before them. The use of chemical weapons by Assad on August 21 shocked and revolted communities of conscience around the world, and as people of faith, we join many in condemning these actions as crimes against humanity. As we now ponder the course of action we should take in response, we recognize that the leaders and citizens of the United States are deeply divided in their convictions about military intervention. According to our best calculations, dire consequences will follow from either action or inaction and neither, it seems, promises to achieve clear, good outcomes. Indeed, a "good outcome" is impossible in a situation as violent and vexed as this one. In a moment like this, it is tempting to retreat to partisan camps and thereby avoid serious moral debate. As people of faith, we urge otherwise. We urge that depth of conscience and humble conviction guide us as we wrestle with this question, together, as one people. Christian realist Reinhold Niebuhr spoke to presidents and congressional leaders often on such matters -- always urging them to not shy away from the hard work of moral reflection and to do so with open eyes and humble but decisive minds and wills. We do not always have the luxury, he reminded us, of solving problems that have clear answers. More often than not, we must wander through moral fog where no path will lead us to daylight clarity. And yet, we must decide what we believe to be the right course of action. We must. unilateral action or inclined to await UN consent, one things is certain -- we know that the president and Congress desperately need grace, courage, and, most especially, wisdom as they cast their votes this week. They need, as well, the prayers of faith communities across our land who recognize the magnitude of the decision before them and the inevitably vexed nature of their response. History may well show that our decision, whatever it may be, was the wrong one -- perhaps with untold, horrific consequences. If so, then our only solace as a nation will be the knowledge that we wrestled honestly and humbly with our options, and we made our decision guided by a sense of moral seriousness and not because of partisan pressure or party politics. The stakes are too high for that. This is not a Democratic or Republican issue; it is a human issue of the highest and most serious magnitude. This week we will celebrate Patriot Day and Commemorate September 11, the National Day of Service and Remembrance. Let us also lift our hearts and minds in prayers and thoughts for Congress and our President as they decide on the weighty matters before them. Dr. Jones will lead the Union community in prayer at its 177th Convocation this Wednesday evening. This truly is "a human issue of the highest and most serious magnitude." If we could only make decisions that reflect our understanding that every human being on the earth was created by God and images God then we would work for solutions to problems that take the use of violence off the table. We have the capacity to use our minds without using violent military action. This is a much harder path but look at what is at stake. Human life is at stake. Obama said in his speech on September 10th that America is different and exceptional. Using military force is not different and exceptional. Courageously walking through the "moral fog"and using creative problem solving skills without using violence would put America in the category of being different and exceptional. leave everything behind and seek God. another human being, Paul says. are inconsequential in relation to the reign of God. horrible mass murder of innocents. give up the convenience to reduce their consumption of fossil fuels. there love to see me walk in! greed. The culture tells us to keep it for ourselves—we’ve earned it. grandchildren, parents who are again housing their adult children. causes of poverty and injustice. roughly ten thousand hours of practice to achieve mastery in a field. achievement. No shortcuts. No naturals. Drop out of college, start a company, and become a billionaire, right? times in their entire career. be elite in. It’s Christianity. elites in any other area, we need to practice Christianity. A lot. Gladwell’s elites practiced 10,000 hours or more before they excel. That’s equal to 40 hours a week for five years. That’s a lot of time. the Beatles. We can practice 24/7. good at being, and acting, Christian, exactly what God made us to be. We end up changed, residents, here and now, in the kin-dom of God. "There’s no point! It’s no good… This means, among other things, this war against evil means saying no to fratricidal hatred, and to the lies that it uses; saying no to violence in all its forms; saying no to the proliferation of arms and their sale on the black market. There are so many of them! There are so many of them! And the doubt always remains: this war over there, this other war over there – because there are wars everywhere – is it really a war over problems, or is it a commercial war, to sell these arms on the black market? These are the enemies we must fight, united and coherent, following no other interests but those of peace and of the common good." "Roman Catholic Womenpriests ordains local woman"
BRECKSVILLE, Ohio -- About 200 people filled the pews at Brecksville United Church of Christ on Saturday when Ann Poelking Klonowski was ordained a priest, in an ordination not recognized by the Roman Catholic Church. 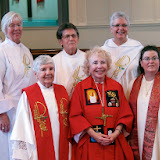 The ordination came through sponsorship of the Great Waters Region of Roman Catholic Womenpriests, which has been holding its own ordinations since 2002. Bishop Joan Houk of Pittsburgh, presiding over the two-hour ceremony, concelebrated Mass with other ordained women priests and deacons. Klonowski's husband, grown children and grandchildren joined the congregation applauding her introduction. She and Roman Catholic Womenpriests consider themselves Catholic and not part of a separatist movement, and expect acceptance by the church will come eventually. The Vatican has decreed that "attempted sacred ordination of a woman" is a delicta graviora, or grave crime, accompanied by automatic excommunication. The Catholic Diocese of Cleveland said in a statement that "the ordination of a woman is not authentically Catholic." A Little Humor:"Toot'n Tell or Go to Hell"
The elderly priest, speaking to the younger priest, said, ''You had a good idea to replace the first four pews with plush bucket theater seats. ''Yes,'' replied the elderly priest, ''and I appreciate that. But the flashing neon sign, 'Toot 'n Tell or Go to Hell' cannot stay on the church roof!" UNITED NATIONS, Sep 4 2013 (IPS) - The United States, which is preparing to launch a military strike on Syria, is being cautioned by several former world leaders and Nobel Peace laureates to seek a political solution to the ongoing crisis – and forego armed intervention in the beleaguered Middle Eastern nation. Former U.N. Secretary-General Kofi Annan, who described the 2003 U.S. invasion of Iraq as “illegal” and a violation of the U.N. charter, unequivocally declared Wednesday there is no military solution to the crisis in Syria. Six Nobel Peace laureates, speaking on behalf of the Nobel Women’s Initiative (NWI), called upon the United States and its allies to use the international legal system, primarily the International Criminal Court (ICC), to respond to the use of chemical weapons in Syria. At the same time, the Brussels-based International Crisis Group (ICG) said if the United States goes ahead with the military attack, it will have taken such action for reasons largely divorced from the interests of the Syrian people. “The administration has cited the need to punish, deter and prevent use of chemical weapons – a defensible goal, though Syrians have suffered from far deadlier mass atrocities during the course of the conflict without this prompting much collective action in their defence,” said ICG. This is the only way, he said, to end the violence and achieve a peaceful settlement based on an inclusive political process. But the Security Council remains deadlocked, with Russia and China threatening to veto any resolution endorsing military action against Syria. The Elders, founded in 2007 by former South African President Nelson Mandela and currently chaired by Annan, is a group that includes former Finnish President Martti Ahtisaari, former Norwegian Prime Minister Gro Harlem Brundtland, former Brazilian President Fernando Henrique Cardoso, former U.S. President Jimmy Carter, former Irish President Mary Robinson and former Mexican President Ernesto Zedillo. In a statement released Wednesday, Annan said the Elders are appalled by the use of chemical weapons against civilians in Syria. “We strongly condemn the use of such weapons as inhumane and criminal. Those responsible must be held accountable both individually and collectively,” the statement read. The group says U.N. inspectors should determine the facts and the United States should await their report to Secretary-General Ban Ki-moon. There is no timeline for the release of the report, which focuses primarily on the chemical arms attack in Syria on Aug. 21. The United States says it has evidence to prove that Syrian security forces were responsible for the attack but President Bashar al-Assad has accused rebel forces of using weapons of mass destruction (WMDs). The Syrian conflict has raged for two and a half years with over 100,000 people killed, many thousands injured, two million refugees and over four million people internally displaced within Syria. “There is no military solution to this conflict. Therefore every effort must be made to stop further bloodshed and to re-energise the political process to put an end to the conflict that has devastated and brutalised Syria,” Annan said. The Nobel laureates, including Jody Williams (U.S.), Shirin Ebadi (Iran), Tawakkol Karman (Yemen), Mairead Maguire (Ireland), Leymah Gbowee (Liberia) and Rigoberta Menchu Tum (Guatemala), are asking the U.N. Security Council to refer the case of the chemical weapons attack to the ICC. “We hope that U.S. legislators, like their British counterparts, will recognize that there is no public appetite to resolve this problem through more bombs and more violence,” said Jody Williams, who won the Nobel Peace prize in 1997 for her work against the use of anti-personnel landmines. “Americans know that any intervention, far from being a strategic move, will only lead to more loss of lives and even possibly to retaliation against Americans,” she added. Last week, British Prime Minister David Cameron lost a vote – on military intervention in Syria – in the House of Commons. The laureates say the use of chemical weapons is a “war crime that should be addressed by the international legal system created precisely for such events”.